Maybe NSA “Moonlighting” Is Another Name for “Public-Private Partnership”? As you’ve likely read, NSA’s Chief Technology Officer has so little to keep him busy he’s also planning on working 20 hours a week for Keith Alexander’s new boondoggle. Dowd is the guy with whom Alexander filed 7 patents for work developed at NSA. That sounds hard to distinguish from Alexander’s new venture. But, he insisted, the behavior modeling and other key characteristics represent a fundamentally new approach that will “jump” ahead of the technology that’s now being used in government and in the private sector. Presumably, bringing Dowd on board will both make Alexander look more technologically credible and let Dowd profit off all the new patents Alexander is filing for, which he claims don’t derive from work taxpayers paid for. Capitalism, baby! Privatizing the profits paid for by the public! All that said, I’m wondering whether this is about something else — and not just greed. Yesterday, as part of a bankster cybersecurity shindig, one of Alexander’s big named clients, SIFMA, rolled out its “Cybersecurity Regulatory Guidance.” It’s about what you’d expect from a bankster organization: demands that the government give what it needs, use a uniform light hand while regulating, show some flexibility in case that light hand becomes onerous, and never ever hold the financial industry accountable for its own shortcomings. Bullet point 2 (Bullet point 1 basically says the US government has a big role to play here which may be true but also sounds like a demand for a handout) lays out the kind of public-private partnership SIFMA expects. Each party brings knowledge and influence that is required to be successful, and each has a role in making protections effective. Firms can assist regulators in making agency guidance better and more effective as it is in everyone’s best interests to protect the financial industry and the customers it serves. The NIST Cybersecurity Framework is a useful model of public-private cooperation that should guide the development of agency guidance. NIST has done a tremendous job reaching out to stakeholders and strengthening collaboration with financial critical infrastructure. It is through such collaboration that voluntary standards for cybersecurity can be developed. NIST has raised awareness about the standards, encouraged its use, assisted the financial sector in refining its application to financial critical infrastructure components, and incorporated feedback from members of the financial sector. In this vein, we suggest that an agency working group be established that can facilitate coordination across the agencies, including independent agencies and SROs, and receive industry feedback on suggested approaches to cybersecurity. SIFMA views the improvement of cybersecurity regulatory guidance and industry improvement efforts as an ongoing process. Effective collaboration between the private and public sectors is critical today and in the future as the threat and the sector’s capabilities continue to evolve. 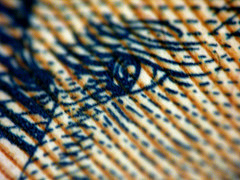 Again, this public-private partnership may be necessary in the case of cybersecurity for critical infrastructure, but banks have a history of treating such partnership as lucrative handouts (and the principle document’s concern about privacy has more to do with hiding their own deeds, and only secondarily discusses the trust of their customers). Moreover, experience suggests that when “firms assist regulators in making agency guidance better,” it usually has to do with socializing risk. In any case, given that the banks are, once again, demanding socialism to protect themselves, is it any wonder NSA’s top technology officer is spending half his days at a boondoggle serving these banks? And given the last decade of impunity the banks have enjoyed, what better place to roll out an exotic counter-attacking cybersecurity approach (except for the risk that it’ll bring down the fragile house of finance cards by mistake)? Alexander said that his new approach is different than anything that’s been done before because it uses “behavioral models” to help predict what a hacker is likely to do. Rather than relying on analysis of malicious software to try to catch a hacker in the act, Alexander aims to spot them early on in their plots. One of the most recent stories on the JP Morgan hack (which actually appears to be the kind of Treasuremapping NSA does of other country’s critical infrastructure all the time) made it clear the banksters are already doing the kind of data sharing that Keith Alexander wailed he needed immunity to encourage. The F.B.I., after being contacted by JPMorgan, took the I.P. addresses the hackers were believed to have used to breach JPMorgan’s system to other financial institutions, including Deutsche Bank and Bank of America, these people said. The purpose: to see whether the same intruders had tried to hack into their systems as well. The banks are also sharing information among themselves. So clearly SIFMA’s call for sharing represents something more, probably akin to the kind of socialism it benefits from in its members’ core business models. In the intelligence world, they use the term “sheep dip” to describe how they stick people subject to one authority — such as the SEALs who killed Osama bin Laden — under a more convenient authority — such as CIA’s covert status. Maybe that’s what’s really going on here: sheep dipping NSA’s top tech person into the private sector where his work will evade even the scant oversight given to NSA. If SIFMA’s looking for the kind of socialistic sharing akin to free money, then why should we be surprised the boondoggle at the center of it plans to share actual tech personnel? Update: Reuters reports the deal’s off. Apparently even Congress (beyond Alan Grayson, who has long had questions about Alexander’s boondoggle) had a problem with this. https://www.emptywheel.net/wp-content/uploads/2016/07/Logo-Web.png 0 0 emptywheel https://www.emptywheel.net/wp-content/uploads/2016/07/Logo-Web.png emptywheel2014-10-21 10:10:322014-10-21 17:06:40Maybe NSA "Moonlighting" Is Another Name for "Public-Private Partnership"? 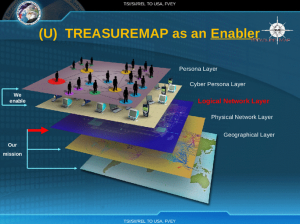 Last week, The Intercept and Spiegel broke the story of NSA’s TREASUREMAP, an effort to map cyberspace, relying on both NSA’s defensive (IAD) and offensive (TAO) faces. 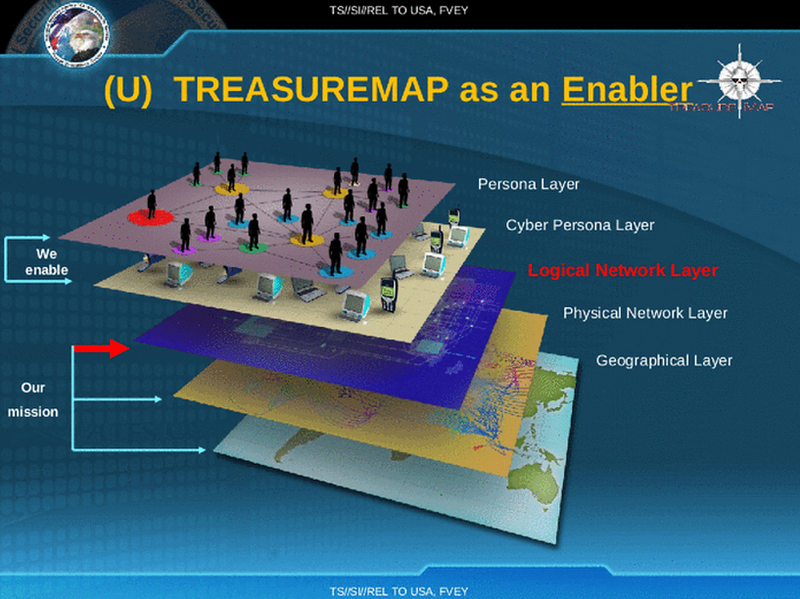 As Rayne laid out, it aspires to map out cyberspace down to the device level. As all great military mapping does, this will permit the US to identify strategic weaknesses and visualize a battlefield — even before many of adversaries realize they’re on a battlefield. Against that background, NYT provided more details on the penetration of JP Morgan’s networks that has been blamed on Russia. The new details make it clear this was about reconnaissance, not — at least not yet — theft. Over two months, hackers gained entry to dozens of the bank’s servers, said three people with knowledge of the bank’s investigation into the episode who spoke on the condition of anonymity. This, they said, potentially gave the hackers a window into how the bank’s individual computers work. They said it might be difficult for the bank to find every last vulnerability and be sure that its systems were thoroughly secured against future attack. The hackers were able to review information about a million customer accounts and gain access to a list of the software applications installed on the bank’s computers. One person briefed said more than 90 of the bank’s servers were affected, effectively giving the hackers high-level administrative privileges in the systems. Hackers can potentially crosscheck JPMorgan programs and applications with known security weaknesses, looking for one that has not yet been patched so they can regain access. Though the infiltrators did observe metadata — which, the NSA assures us, is not really all that compromising. A fourth person with knowledge of the matter, also speaking on condition of anonymity, said hackers had not gained access to account holders’ financial information or Social Security numbers, and may have reviewed only names, addresses and phone numbers. I’m not trying to make light of the mapping of one of America’s most important banks. Surely, such surveillance may enable the same kind of sophisticated attack we launched against Iran, having done similar kind of preparation. But we should keep in mind what the US has been doing as we consider these reports. If and when Russia or Germany catch us conducting similar reconnaissance on the networks of their private companies, they will surely make a big stink, as we have been with JP Morgan (though the response to the Spiegel story has been muted enough I suspect Germany’s intelligence services knew about that one, particularly given NSA’s reliance on Germany for targets in Africa). But if the US is going to treat digital reconnaissance as routine spying (and the President’s cyberwar Presidential Policy Directive makes it pretty clear we consider our own similar reconnaissance to be mere clandestine spying), then we should expect the same treatment of our most lucrative targets. That doesn’t make it legal or acceptable. But that does make it equivalent to what we’re doing to the rest of the world. One final point. If you’re going to map the entire Internet, any device, anywhere, by definition you need to map America’s Internet as well. Are we so sure our own Intelligence Community hasn’t been snooping in JP Morgan’s networks? On Sunday I asked who was crying wolf — JP Morgan itself, or Mike Rogers — about the claimed JP Morgan attack that might not be a serious attack at all and had been attributed to Russia without yet proof of that. So who should crawl out of his sinecure but Keith Alexander? Keith Alexander, the NSA director from 2005 until last March, said he had no direct knowledge of the attack though it could have been backed by the Russian government in response to sanctions imposed by the U.S. and EU over the crisis in Ukraine. The hackers who attacked JPMorgan, the biggest U.S. bank, were “a group with exceptional skills or a nation-state backed group,” Alexander said in an interview yesterday at Bloomberg’s Washington bureau. Note how Alexander admits he has no personal knowledge of the attack but then opines about the skills of the hackers and goes from there to hypothesize how this was a response from Russia? So maybe it wasn’t JP Morgan or Mike Rogers crying wolf. It sure looks like Alexander is willingly feeding the poorly evidenced claims about this hack. But don’t worry, Keith Alexander doesn’t have a conflict of interest at all. Is This Why Banksters Don’t Go to Jail for Laundering Terrorist Finances? I’m in the middle of a deep dive in the Section 215 White Paper — expect plenty of analysis on it in coming attractions! But I want to make a discrete point about this passage, which describes what happen to query results. Results of authorized queries are stored and are available only to those analysts trained in the restrictions on the handling and dissemination of the metadata. Query results can be further analyzed only for valid foreign intelligence purposes. Based on this analysis of the data, the NSA then provides leads to the FBI or others in the Intelligence Community. For U.S. persons, these leads are limited to counterterrorism investigations. The Primary Order released several weeks back calls these stored query results “the corporate store.” As ACLU laid out, the government can do pretty much whatever it wants with this corporate store — and their analysis of it is not audited. The passage from the White Paper seems to suggest there are limits (though it doesn’t explain where they come from, because they clearly don’t come from FISC). This analysis must have a valid foreign intelligence purpose — which can include political information, economic information, espionage information, military information, drug information, and the like. Anything other countries do, basically. At one level, this is (small) comfort, because it provides a level of protection on the dragnet use. But it also may explain why HSBC’s US subsidiary didn’t get caught laundering al Qaeda’s money, or why JP Morgan always gets to self-disclose its support for Iranian “terrorism.” So long as the government chooses not to treat banks laundering money for terrorists as material support for terror, then they can consider these links (which surely they’ve come across in their “corporate store!) evidence of a financial crime, not a terrorist one, and just bury it. I would be curious, though, whether the government has ever used the “corporate store” to police Iran sanctions. Does that count as a counterterrorism purpose? And if so, is that why Treasury “finds” evidence of international bank violations so much more often than it does American bank violations? https://www.emptywheel.net/wp-content/uploads/2016/07/Logo-Web.png 0 0 emptywheel https://www.emptywheel.net/wp-content/uploads/2016/07/Logo-Web.png emptywheel2013-08-10 16:11:412013-08-10 16:20:16Is This Why Banksters Don't Go to Jail for Laundering Terrorist Finances? Sherrod Brown and Chuck Grassley have sent a list of questions they want Eric Holder to answer by February 8. Has the Justice Department designated certain institutions whose failure could jeopardize the stability of the financial markets and are thus, “too big to jail”? If so, please name them. Has the Justice Department ever failed to bring a prosecution against an institution due to concern that their failure could jeopardize financial markets? Are there any entities the Justice Department has entered into settlements with, in which the amount of the settlement reflected a concern that markets could be impacted by such a settlement? If so, for which entities? Please provide the names of all outside experts consulted by the Justice Department in making prosecutorial decisions regarding financial institutions with over $1 billion in assets. Please provide any compensation contracts for these individuals. How did DOJ ensure that these experts provided unconflicted and unbiased advice to DOJ? I’m interested in their focus on contractors. Has someone like Promontory Financial Group been making these decisions too? In any case I await Holder’s non-responsive answer with bated breath.